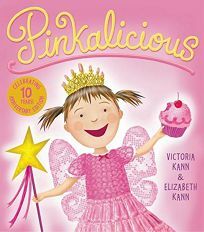 After a day of eating too many pink cupcakes (they're ""pinkalicious!"") a pigtailed girl wakes up to discover she's pink through and through. The pink-crazed protagonist joins several others starring in recent titles (Kate Feiffer's Double Pink; J.otto Seibold's The Fuchsia Is Now). ""I cried because I was so beautiful,"" gushes the heroine. ""I even had pink tears."" And given the pediatrician's suggested cure-""a steady diet of green food""-the girl is perfectly happy to remain as she is. But when she covertly eats one more pink cupcake and turns fire-engine red, she realizes it's time to take the doctor's advice. A witty montage of photos, clip art and drawings captures the heroine eating every kid's nightmare: ""pickles and spinach, olives and okra."" The text may be literal and obvious, but the artwork creates enough visual interest to keep pink-loving gals involved in this tale of wonderful-to-wretched excess. Ages 5-8.